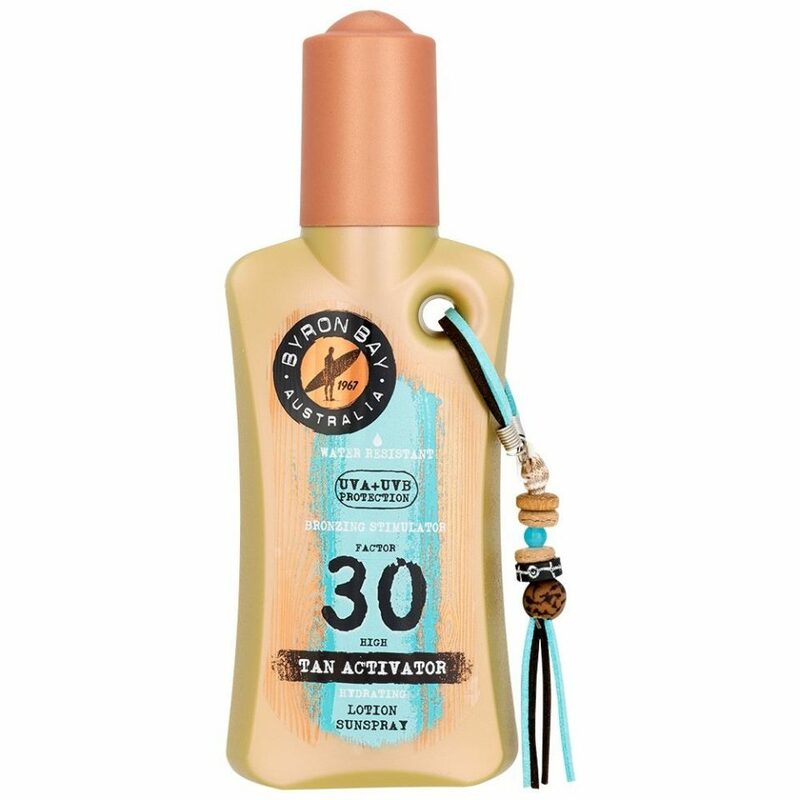 Byron Bay Tan Activator SPF 30 protects your skin againgst the harmful UVA and UVB rays. The unique formula contains a bronzing stimulator for a deeper tan and helps to prevent premature ageing caused by the sun. Besides that, the Tan Activator has a delicate summer fragrance and all bottles have a trendy look thanks to the charm with real shells and hand-made wooden beads. Byron Bay Tan Activator has the maximum Boots 5-star rating for protection against the harmful, deeply penetrating UVA radiation. Protect your skin well and get that desired golden brown Byron Bay tan! Ingredients: Aqua, C12-15 Alkyl Benzoate, Ethylhexyl Salicylate, Butyl Methoxydibenzoylmethane, Octocrylene, Diethylamino Hydroxybenzoyl Hexyl Benzoate, Glycerin, Dicaprylyl Ether, Triacontanyl PVP, Phenylbenzimidazole Sulfonic Acid, Ethylhexyl Triazone, Vitex Agnus Castus Extract, Avena Strigosa Seed Extract, Bis-Ethylhexyloxyphenol Methoxyphenyl Triazine, Aminomethyl Propanol, Alcohol, Acetyl Tyrosine, Parfum, Cetyl Alcohol, Glyceryl Stearate, Microcrystalline Cellulose, Tocopheryl Acetate, Sodium Stearoyl Glutamate, Diethylhexyl Butamido Triazone, Acrylates/C10-30 Alkyl Acrylate Crosspolymer, Cellulose Gum, Xanthan Gum, Phenoxyethanol, Benzyl Alcohol, Lecithin, Tocopherol, Potassium Sorbate, Citric Acid.